Chinese Turn To Religion To Fill A Spiritual Vacuum Alongside China's astonishing economic boom, an almost unnoticed religious boom has been taking place. The collapse of the communist ideology created a void that has left many Chinese looking for a value system. NPR looks at the trend in a five-part series beginning Monday on All Things Considered. Many Chinese are looking for a value system to counterbalance the country's rampant materialism. Believers of the folk goddess Mazu on Meizhou Island off China's southeast coast carry a statue of her to the main square during a celebration of her 1,050th birthday. The goddess is believed to protect fishermen at sea and help the poor, and her popularity is growing. The Chinese government is now encouraging the worship of deities in the folk, Daoist and Buddhist pantheon. Alongside China's astonishing economic boom, an almost unnoticed religious boom has quietly been taking place. In the country's first major survey on religious beliefs, conducted in 2006, 31.4 percent of about 4,500 people questioned described themselves as religious. That amounts to more than 300 million religious believers, an astonishing number in an officially atheist country, and three times higher than the last official estimate, which had largely remained unchanged for years. Since 2006, the position of China's government has been that religion can be a force for good toward the ultimate aim of creating a "harmonious society." "What is important is that the work should be done on a legal basis," Ye Xiaowen, the official then in charge of religious affairs, told state-run Xinhua news agency in July 2006, in his first interview in a decade. Ye, seen as a hardliner, was replaced by his deputy Wang Zuo'an in September 2009. The State Administration for Religious Affairs refused to comment for this series, and turned down repeated requests for interviews over an extended period of time. China has a long history of peasant rebellions fueled by religious belief, and observers say the communist government still views religion with caution, seeing it as a social issue and political issue that could affect social stability. "It doesn't matter to the Chinese government whether you are a farmers' union, a Boy Scout troop, the Red Cross or the Catholic Church," says Sister Janet Carroll, a nun who has been active in China for decades. "If you gather people together, have authorities in place, financial means and some sort of organizational control over groups of people, the Chinese government wants to not only know about it, but also have a say about how it all functions." To that end, after the communist revolution in 1949, the government recognized five official religions: Protestantism, Catholicism, Buddhism, Daoism and Islam. For each of them, associations were set up to supervise and monitor religious practice. China adopted the religious policy of the Soviet Union, with a few adaptations, says the Rev. Michel Marcil, director of the U.S. Catholic China Bureau. "They had no idea of what a religious policy was," he says. But Marcil says conversations with Chinese religious affairs officials last year have led him to believe there could be policy changes. "They said, 'We are now trying to find something which would be much more adapted to China and its present situation than what we took from Russia back in 1949,' " he says. 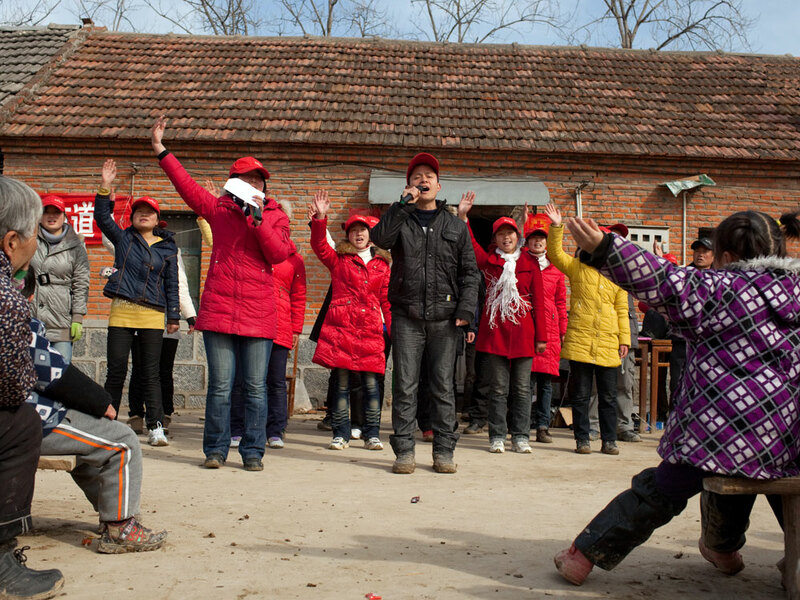 A group of young Christians preaches on the streets in a rural Chinese village. 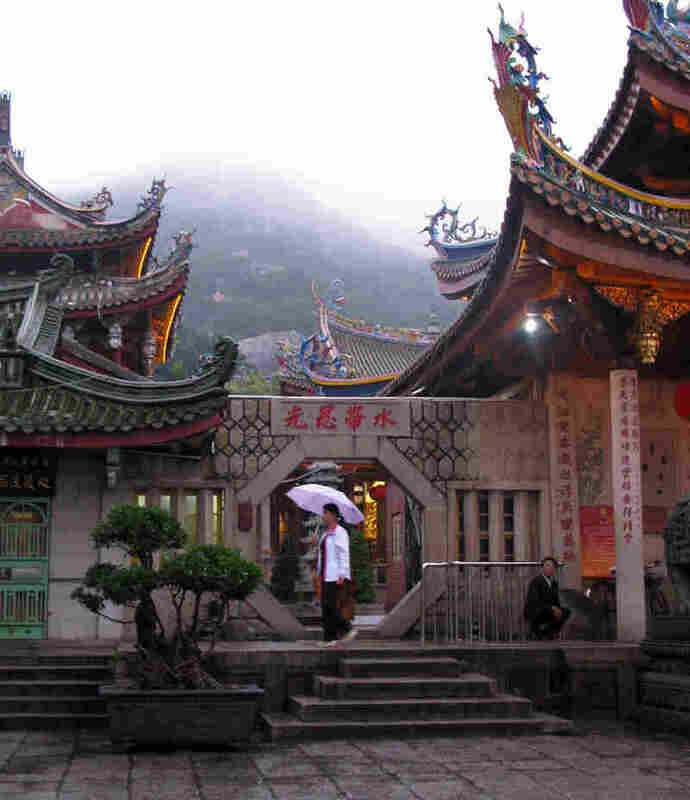 China's constitution protects freedom of religion but prohibits proselytizing in public places. Across China, religious belief has blossomed and flourished -- far outpacing the government's framework to control it -- with a profusion of charismatic movements and a revival in traditional Chinese religions. Two-thirds of those who described themselves as religious in the 2006 survey said they were Buddhists, Taoists or worshippers of folk gods such as the Dragon King or the God of Fortune. 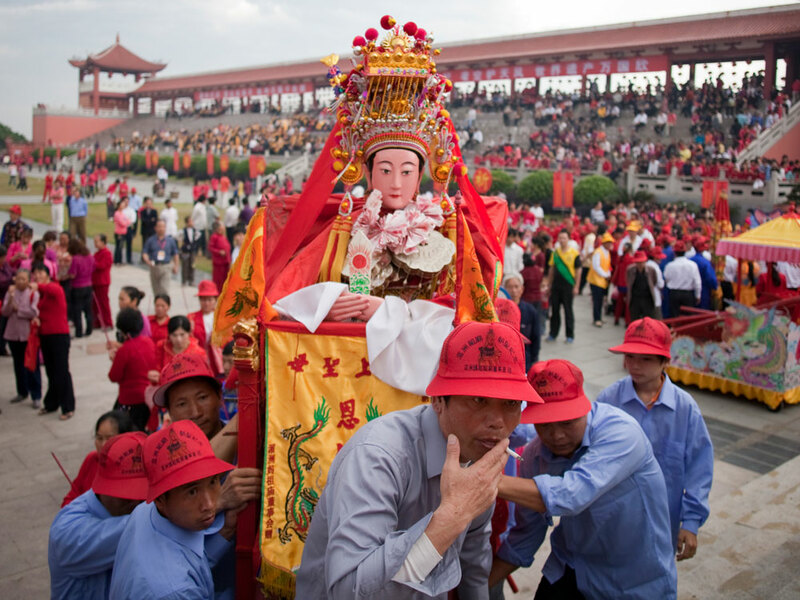 Another popular goddess is Mazu, who is believed to protect sailors. 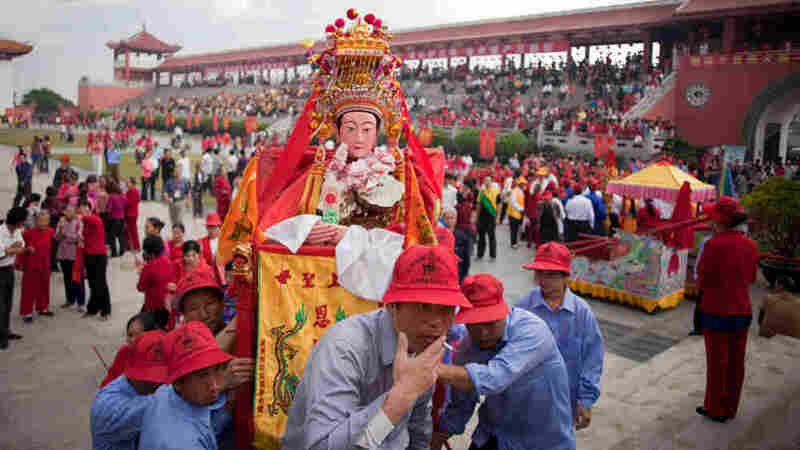 Although she is included in the Daoist and Buddhist pantheons, she -- and many other indigenous popular gods -- falls outside China's five official religions. However, the worship of Mazu recently has been reclassified as "cultural heritage" rather than religious practice, making it acceptable even for Communist Party members. Academics say that model is being used elsewhere in China for other indigenous folk religions. There are also government attempts to support traditional Chinese practices such as ancestor worship, by changing the public holidays. In 2009, the government declared the Qingming Festival -- the traditional day for sweeping graves -- a public holiday for the first time, allowing much larger numbers of people to sweep their ancestral graves. "Now the government supports us," says Shao Longshan, his cheeks still tear-stained after bowing deeply in front of the grave of his late wife, Zhu Jiefen, at a cemetery on the outskirts of Shanghai during the Qingming Festival in early April. "Not only does this let the people who are alive remember those who have gone, but [it allows us to] keep the Chinese traditions and culture." The Chinese government has also given extra support to Buddhism in what scholars say is an attempt to counterbalance the explosion of Christian faith. Another recent development is that increasing numbers of younger people are practicing religion. The 2006 survey showed 62 percent of religious believers are 39 and younger. This trend was evident at an unregistered meeting of Christians worshipping in a charismatic underground prayer meeting in the coastal city of Wenzhou, known as "China's Jerusalem." Many of the devout were young and obviously well-off. Such underground Christians have recently received surprisingly sympathetic coverage in the state-run media, raising hopes that their meetings may be legitimized. One scholar, Liu Peng of the Chinese Academy of Social Sciences, told the Global Times that "a huge gap" exists between the government's position on religion and Christians' needs. "House churches also operate on a smaller scale, which means people's spiritual needs can be met more easily and they elect their own pastors. ... It's rather like the economic changes. When state-owned enterprises couldn't meet the public's needs, private businesses naturally appeared," he told the newspaper. That link between belief and wealth is also apparent in the emergence of "boss Christians," or Christian entrepreneurs, in Wenzhou. 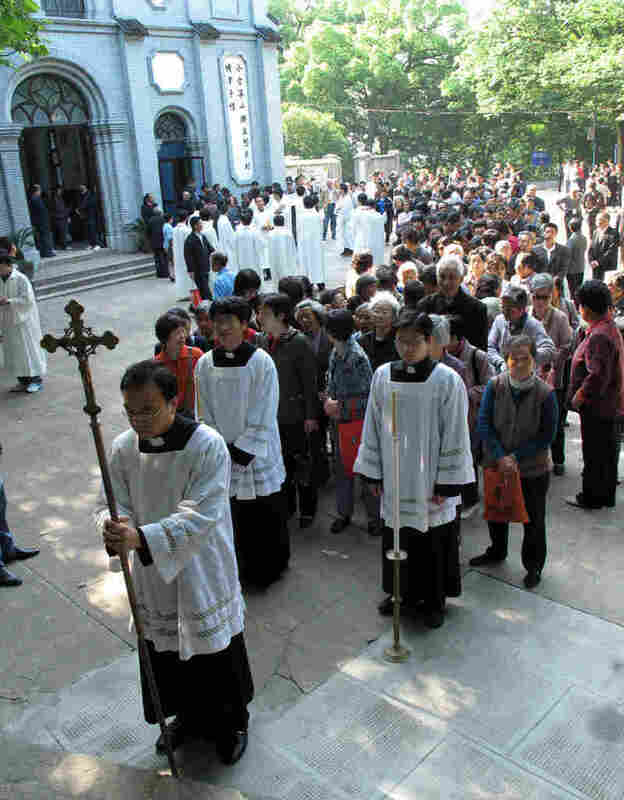 Academics say they are helping the rapid spread of Christianity in China by building churches elsewhere to spread the "Wenzhou brand" of Christianity. There has already been a significant relaxation of the government's religious policies over the past decade. New regulations passed in 2005 allow religious groups to send members overseas for study and to publish religious literature, among other things. For Catholics, this has led to many clergy being able to study in the U.S. and elsewhere. They are struggling with both the theory and practice of reconciling communities who have been divided for decades: the state-sanctioned church and underground communities loyal to the Holy See. The economic boom also is having unforeseen consequences for China's Muslims, in particular its female imams, who report difficulty recruiting new imam candidates because of the paltry salaries. China is the only place in the world that has a tradition of independent female mosques, with their own ahong, or imams, to lead prayers and teach the Quran to women. But older female ahong report that the economic opportunities offered elsewhere mean that few women are drawn to the profession. Yao Baoxia, a female imam, sits alongside believers while leading prayers at a mosque for women in Kaifeng in central China. The institution of female imams, known as ahong, is believed to be unique to China. On a wide range of religious issues, there's clearly pressure for change in China from the grass roots, and some observers have noticed a new responsiveness from the top down. "This is not simply something from below, but it's being met from above in constructive ways as well," says Tom Banchoff, director of Georgetown University's Berkley Center for Religion, Peace and World Affairs. His organization holds annual meetings with Chinese religious affairs officials. He says this new attitude is evidenced by "the fact there are centers for religious studies arising at universities around China with public support, the fact that there's now a discourse about the positive role that religion can play in Chinese society." This does represent a change in attitude, but at the same time, many accounts are emerging from within China of leaders of larger unsanctioned religious groups being subject to official harassment and persecution, sometimes ending up in detention and even jail. China's communist leaders are, it appears, still struggling with how to deal with this unruly religious boom, and their cautious steps forward sometimes end up being counterbalanced by reflexive crackdowns at a local level. 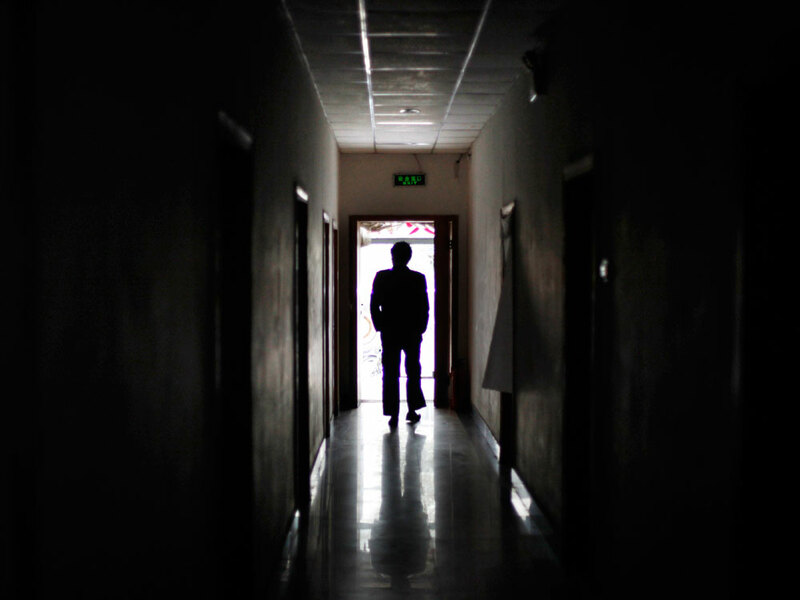 A man walks through a Beijing building formerly used as a secret detention center in 2009. In these "black jails," Chinese citizens are held, forcibly restrained and sometimes beaten to prevent them from lodging formal complaints with the central government. If you consider that as recently as a generation ago, China did not have any trial lawyers or a criminal law, the country has come a long way in establishing a legal system. But there are many instances in which the laws on the books don't have much effect, and society runs according to a completely different set of unwritten rules. Some Chinese call these "hidden rules." An example of how these hidden rules work can be found just a couple minutes' walk from one of Beijing's busiest downtown intersections. 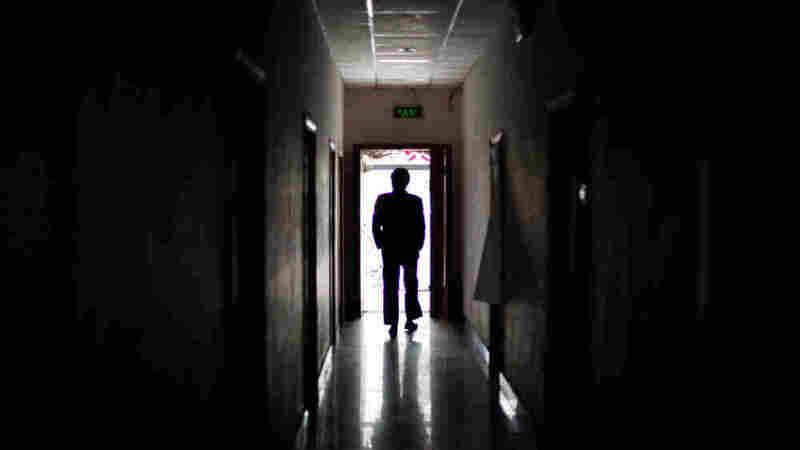 China has denied the existence of "black jails" to the United Nations' human rights commission, but almost anyone petitioning the government can show you one. Inside the Beijing hotel, a human rights activist explains, is a woman named Liu Xinyu, who has come to the capital to complain that a developer bulldozed her ancestral home without paying her a fair price. In the hall outside her room, Liu stands next to two sullen and bewildered-looking young women Liu says were hired to guard her -- one short and plump, the other tall and skinny. Petitioner Liu Xinyu stands outside a Beijing hotel where she was recently detained by provincial officials. The hotel is run by the Guangxi provincial government's liaison office in Beijing. Unlike some secret detention facilities, known in China as "black jails," there are no iron bars on the hotel's doors or windows, but Liu says two female guards were hired to monitor her around the clock. Liu ignores them and goes into her room to talk in private. "I was brought here by people sent by the provincial government to stop me from petitioning," she explains, seated on the bed, wearing a leopard-spotted T-shirt and black tights. "I haven't exactly been detained here, but I'm not free, and they won't let me leave," she says nervously. The officials have told Liu that they are just there to protect her. But when she makes her way to the door, a middle-aged official in the hallway objects. "You'd best leave this matter to us," he says. He dodges the microphone and refuses to answer questions. "China is different," he insists. "We have our regulations here." Liu makes it to the street, heading for a drug store, with the official trailing not far behind. Liu eventually returns to the hotel, clinging to hope that the government will help her. Liu's hotel is a minimum-security facility. There are other makeshift detention facilities in places like rented farmyards and guesthouses that are better guarded. Although Chinese law gives citizens the right to petition the government to redress their grievances, petitioners say the government treats them like outlaws. And they say police are often complicit in the black jails' operation. Zhao Fusheng, who is from Sichuan province, says he was detained in his provincial government's liaison office when he came to Beijing to file a petition. He says it was impossible to tell that it was a black jail from the outside. "Once the provincial liaison officials get a hold of you, they put you in their basement," Zhao says. "Above the basement is a storefront. A door in the storefront opens, they throw you inside, and you're behind a layer of guards. If you disobey, they beat you." Zhao says black jails have become a kind of cottage industry in Beijing. "The provincial liaison offices pay the black jail operators the equivalent of $36 per detainee per day. Of that, about $15 goes to hire a guard, another $15 for food, and the rest for accommodations," Zhao says. Joshua Rosenzweig, Hong Kong research manager for the human rights group the Dui Hua Foundation, says that while the central government wants citizens to inform on corrupt officials, it also expects local officials to maintain order and keep petitioners out of the capital. "If you have petitioners from your area flocking to Beijing," Rosenzweig says, "it's a sign that you're not doing your job very well at the local level. And therefore, as a local official, you're going to do everything you can to stop those people from making you look bad." Many local governments also maintain informal detention centers. Petitioner Jin Hanyan, from central Hubei province, says she accused her county's Communist Party secretary of corruption. For this, she says, she was sent to a "study class" in an abandoned factory. Of course, she says, no studying actually went on in there. "In the mornings, they'd yell to wake us up," Jin says. "They'd make us do calisthenics and pull weeds. If you didn't obey, they'd beat you to within an inch of your life and withhold medical treatment if you got sick. They said the county party secretary told them it was not illegal to beat us to death." Following that interview, word comes that Jin has been forcibly detained in a mental institution by her local government. Beijing-based journalist Wu Si says the black jails are an expression of the phenomenon he explored in his 2002 book Hidden Rules. Government censors banned the book, but society now widely uses the term to describe the way things really work in China today. "There have been many of these kinds of places, both in China's history and in the present day," Wu says. "They're an expression of officials' power to legally harm citizens. I call them 'gray jails.' They're neither formal jails, nor something that is entirely illegal. They're an oddity that exists in a sort of gray area." China is certainly not the only society with hidden rules. Nor is it the only society in which the rule of law is often a mere fig leaf for the rule of man. But China's hidden rules are especially elaborate. They are also in glaring conflict with the country's laws and with the Confucian virtues that centuries of Chinese governments have espoused. "The formal rules used to say that county officials should act like people's parents," Wu says. "In fact, they acted like masters and lorded it over the common people. Those beneath them had to show deference, kowtow before them, and offer them all sorts of goods and favors." Some time after NPR's interview with Liu Xinyu at the Beijing hotel, local human rights activists freed her. Standing outside, Liu says she now sees her former captors as pathetic. "If the local government would just try to resolve our problems for us, then we wouldn't have to petition the higher authorities," Liu says. "There was a time when we trusted the government to resolve our problems. But they didn't respond with sincerity." The Dui Hua Foundation's Rosenzweig points out that local officials could strike at the root of the problem by resolving the petitioners' problems. But unfortunately, that's not the way the hidden rules work, and for that reason, they devote their energies to silencing the petitioners.